The Dawn of Defiance campaign is a series of 10 downloadable adventures using the Saga Edition rules. Originally published on the Wizards of the Coast Star Wars RPG website, the adventures can be played individually, but when played in order, they form a complete campaign with a story arc that takes players from 1st level to 20th level. These adventures were made available for free, and are collected here for archival purposes. From the original FAQ: The Dawn of Defiance campaign is a chance to experience the Star Wars Roleplaying Game in a new and exciting way. The campaign lets players grow as heroes from the lowliest beginnings to galaxy-influencing greatness. It also gives us the opportunity to show people what a Saga Edition campaign might look like and help Gamemasters provide an exciting game experience across many levels. 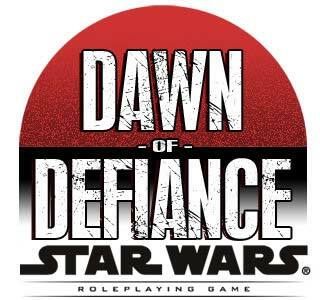 The Dawn of Defiance campaign is our chance to provide an iconic Star Wars Roleplaying Game experience that can be shared across the community. Download SWDOD01: The Traitor's Gambit. Download SWDOD02: A Wretched Hive. Download SWDOD03: The Queen of Air and Darkness. Download SWDOD04: Echoes of the Jedi. Download SWDOD05: The First to Strike. Download SWDOD06: The Core of Corruption. Download SWDOD07: A Reckoning of Wraiths. Download SWDOD08: The Gem of Alderaan. Download SWDOD09: Sword of the Empire. Download SWDOD10: Jaws of the Sarlacc. Download the Dawn of Defiance Campaign Gamemaster's Outline.